Not many theologians have had as great an impact on the study of peace and violence as Dietrich Bonhoeffer, who was labeled an Enemy of the State and eventually executed in April 1945. In this book, Trey Palmisano examines the theological connection between peace and violence across a range of Bonhoeffer's writings, sermons, and letters. Despite the challenges Bonhoeffer experienced in his personal life and in the life of his country, Palmisano asserts that a strong consistency emerges in Bonhoeffer's approach to ethics that resonates in the positing of Christ as the center of all ethical discourse and orients one to the ever-present challenges of a changing world. 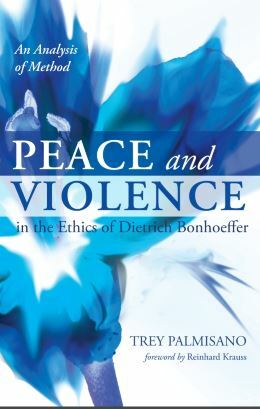 Palmisano creates distance from former studies that sought to define Bonhoeffer as a committed pacifist, a situational pacifist, or one who compromised his values to accommodate an exception for violence. By prioritizing methodology as the key to interpreting Bonhoeffer's thought, Palmisano argues that the ethical dilemma thought to be caused by Bonhoeffer's actions is avoided. The result is one that creates an authentic ethical openness by responsiveness to Christ rather than Christian virtue, and frees the individual from redundancies of action derived from deeply embedded patterns of theological engagement. ""Dietrich Bonhoeffer has become a hero to many Christians and denominations, and it seems he is like St. Francis in that everyone thinks he is on their team. Trey Palmisano will rip Bonhoeffer from such customary colonizations and give him back to you--as he was, unadorned, full of complexity, and a man for his context. Bonhoeffer's peace ethic, explored here with exquisite care in a christological center, becomes a challenge not a prescription, a contextualized example not a model to copy, and a theological ethic at its best."" --Scot McKnight, Julius R. Mantey Professor of New Testament, Northern Seminary ""In the continuing and important discussion of how to understand Bonhoeffer's emphasis on peace alongside his participation in a conspiracy against Hitler, Palmisano's contribution is significant. His careful attention to Bonhoeffer's theological and ethical concerns and his patient working with Bonhoeffer's texts give rise to a well-founded and nuanced interpretation which commands notice and respect."" --Jennifer Moberly, Tutor, Cranmer Hall, Durham University; Author of The Virtue of Bonhoeffer's Ethics Trey Palmisano is an independent scholar and graduate of the Ecumenical Institute of Theology, St. Mary's Seminary & University in Baltimore, MD.